I really wanted to make croquetas de jamon (Spanish ham croquettes) when I made the other tapas dishes, but sadly didn’t have time. But that didn’t stop me. Instead I made them the day after when I had more time on my hands and served them appropriately as a starter snack with a nice bottle of cava. 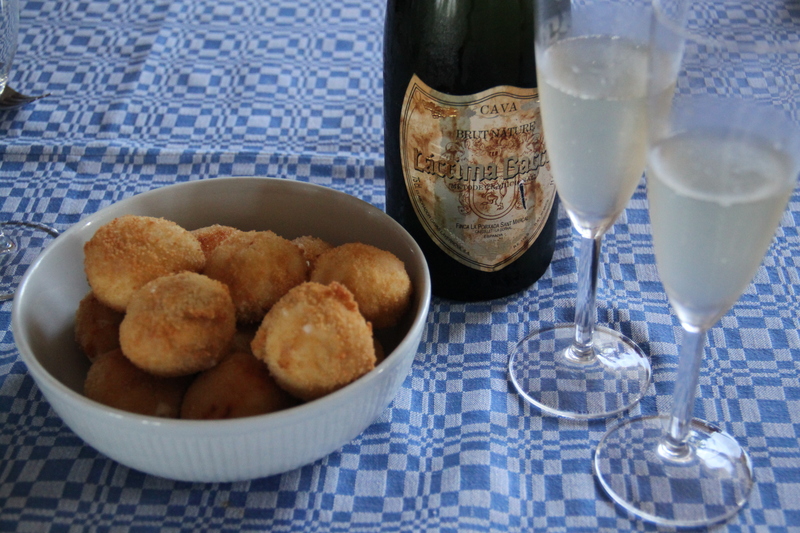 It was the first time I made croquetas and it wasn’t difficult at all. Much easier than I expected actually, and lots of fun! But it does take a while to make them. About 45 minutes to make the bechamel, three hours to rest and then another 30 minutes to fry them. But it’s completely worth it. I halved the recipe from the book Tapas Revolution by Omar Allibhoy, making 12 instead of 24 croquetas, but they are quite large so you could easily make 16 from the recipe. Melt the butter in a nonstick pan over medium heat. Add the chopped onion and ham. Cook for a few minutes until the onion turns translucent but not coloured. Meanwhile, in a separate pan, bring the milk almost to the boil and set aside. Add the flour to the onions and cook for 5 minutes, stirring, until the flour has toasted a bit. Add the hot milk little by little, whisking all the time, to make a thick roux. Keep going until you have added all the milk and you have a smooth and silky bechamel. When it comes to the boil reduce the heat to low and add nutmeg, salt and pepper. Leave to simmer for about 40 minutes, whisking to make sure it doesn’t stick to the bottom of the pan. Line the bottom of a baking tray with baking parchment and then pour the bechamel into the baking tray. Spread it out and then immediately place a layer of cling film directly on top, making sure the cling is touching the surface of the bechamel as this will stop a skin from forming. Transfer to the fridge and chill completely. After three hours the bechamel should be firm enough to handle. Peel off the cling film, turn the bechamel out on to a floured surface and carefully peel away the baking parchment. Sprinkle with more flour and use a knife to cut the bechamel into 12-16 equal squares. Dust hands with flour and roll the squares into balls between your hands. Beat the egg in a bowl and pour the breadcrumbs out onto a plate. Dip each ball in the egg and then roll in the breadcrumbs. Heat up the oil in a large deep pan until it reaches 180C. Fry the croquetas in small batches until golden and crisp (takes about 1 1/2 minutes). Remove with a slotted spoon and drain on kitchen towel before serving. 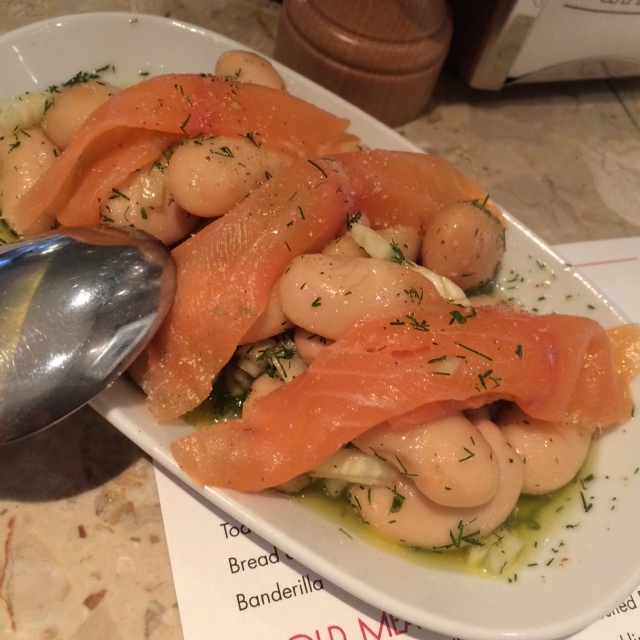 Barrafina is one of my favourite tapas places in London, both the newer one in Covent Garden (and dangerously close to my office) and the original on Frith Street in Soho. They have also just opened another restaurant on Drury Lane which I can’t wait to try! I really like that the different restaurants sport different (although similar) menus, which makes it feel like two (or now three) free-standing restaurants and not a chain. Felicity and I had dinner here the other week and while waiting for our table we had some Txakoli (semi-sparkling wine from the Basque region which I love) and crab croquetas. 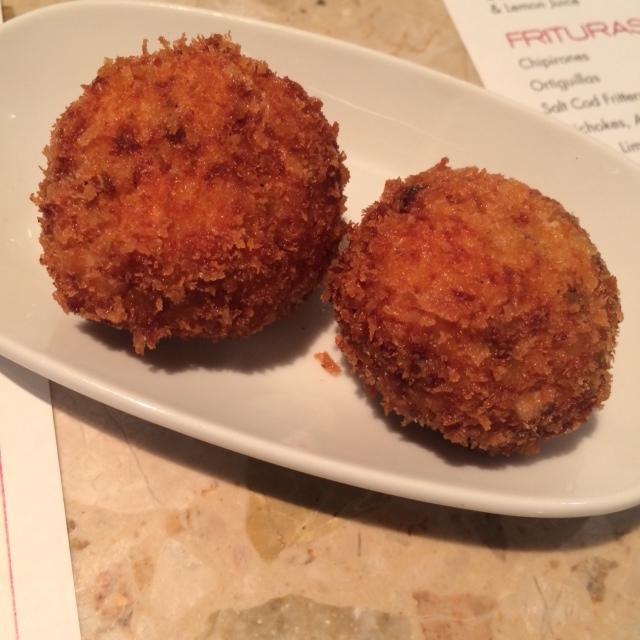 When seated at the bar we noticed they had jamon croquetas as a special and we just couldn’t resist haveing some more croquetas. The crab ones are yummy but the jamon ones were perfection. Oh wow! Next up we had smoked salmon with white beans, fennel and a dilly dressing. It was nice but a little too mild in flavour. 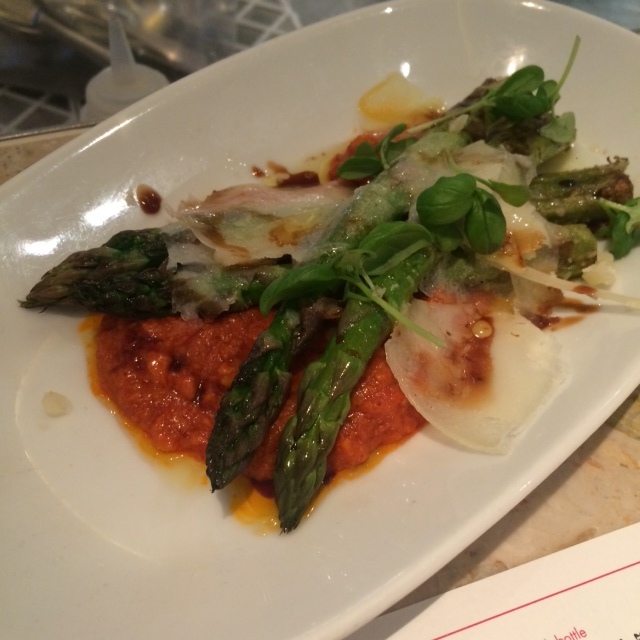 The asparagus with romesco sauce was wonderful though, I’ve had it here before and it has always been a great vegetable dish. 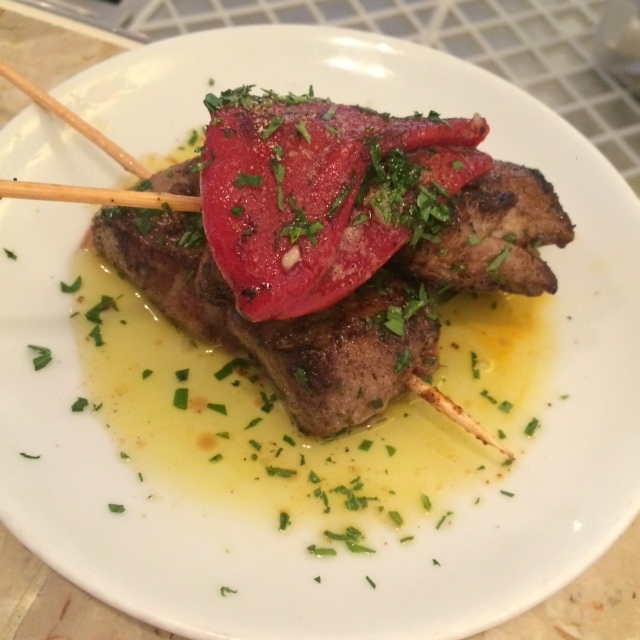 The skewes with Iberico ham were also really nice, but I’ve had even better pork in Spain. We then decided to try the lamb’s brain (!). Once when I came here for lunch a lady dining on her own came here especially for the lamb’s brain and raved about it, so I’ve been dying to try it ever since. And I must say I was pleasantly surprised! 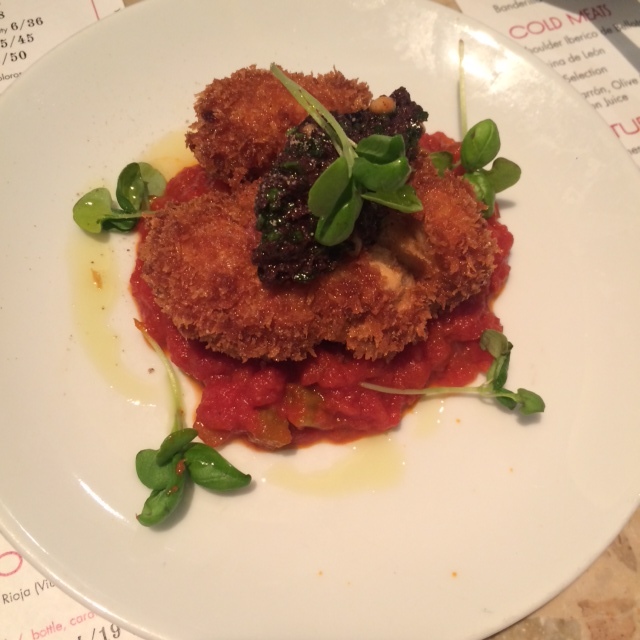 The texture is very soft so frying it until crisp on the outside was a smart move and the bold flavours with lots of acidity cuts through the richness very well, so this dish got top marks from me. But, the texture is still a little strange in the mouth (like very very soft sweetbreads but more jelly like) and it’s so rich I would not have been able to finish the dish on my own. But I would happily go back and share it with someone. After the savoury dishes we were quite content but you always have room for sorbet, right, so we had a scoop each. 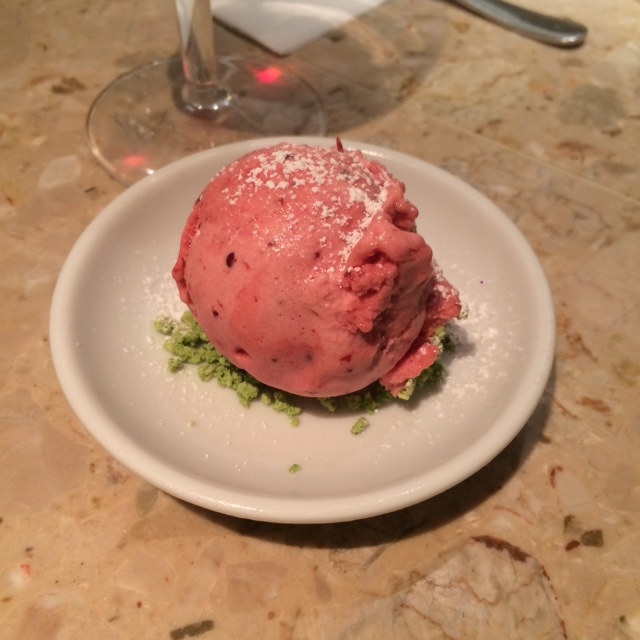 Felicity’s mixed berries sorbet was really nice and fruity, the perfect ending to a lovely meal. 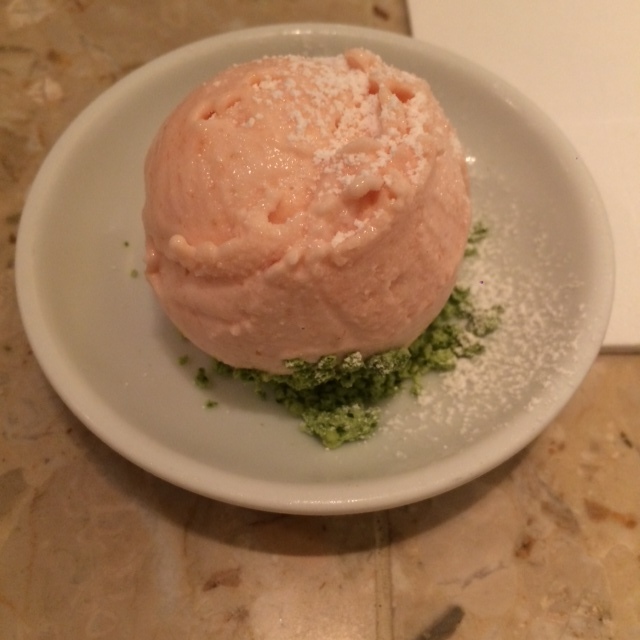 My peach sorbet was a bit too sweet and cloy. But apart from that our dinner was fantastic, just like the company.